Therma-Tru manufacturers fiberglass doors, a market they helped launch over 25 years ago. Every fiberglass door they make is well designed and built to perform with little maintenance required. They also feature architecturally correct components for wider planks and glass. In addition to fiberglass doors, some exterior doors are also constructed in steel. Simple vertical lines and Shaker-style recessed panels are hallmarks of this classic collection. With many different glass designs and Low-E glass, you’ll love the look and craftsmanship of these Therma-Tru exterior doors. Choose from stained or painted to finish the look. These doors are made with a mahogany wood look and have matching sidelites. These architecturally correct doors are styled for the American Southwest or European-inspired design. Add accents to grooved panels and arches for added style. Sleek and modern, these oak doors can be stained or painted look. A smooth, paintable fiberglass door is here to make your own. These fiberglass doors are specially designed to be painted if this is the look you desire. 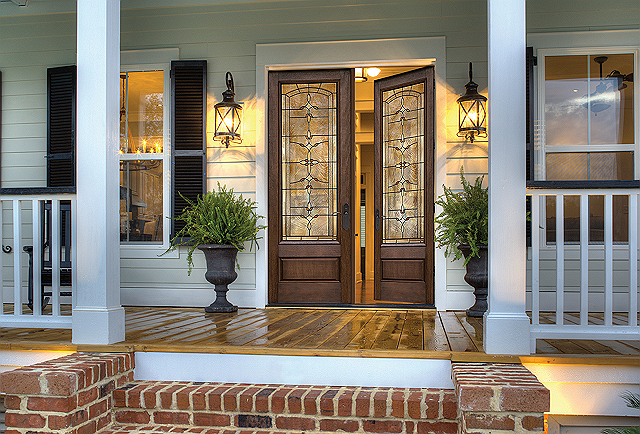 This collection of doors is the classic fiberglass classic door. It’s available in Oak or Mahogany with the woodgrain apparent in every line. Crisp, clean lines are a hallmark of this door. It’s the ideal choice for those who want a wood painted look. Therma-Tru builds well-made doors, but you have to be you keep that same quality in the installation. Armored Dade has installed many Therma-Tru doors over the years and has the right experience to deliver a well-installed door quickly and efficiently. Check out our selection of Therma-Tru doors.